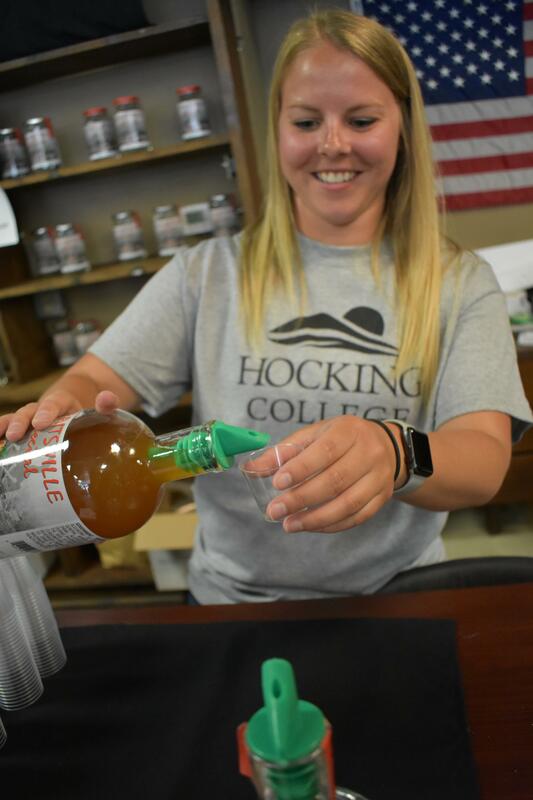 On Thursday, May 24, Hocking College hosted a special ribbon-cutting ceremony to announce the grand opening of the revitalized New Straitsville Distillery, formerly known as the Straitsville Special Moonshine Distillery. The ribbon was cut by Dr. Betty Young, president of Hocking College, and Sean Terrell, Dean of Workforce Development and Community Engagement. Students from the Natural and Historical Interpretation program were dressed in period clothing for the event. This event was hosted on the first day of the 48th annual New Straitsville Moonshine Festival. Guests and festival attendees were invited to explore the reopened distillery and to sample and purchase Straitsville Special Moonshine. Custom Hocking College Moonshine Chocolates were specially crafted by Hocking College's Chef Touria Semingson to sell during the festival. Known as the Bootleg Capital of Ohio during the Depression, New Straitsville was famous for concealing dozens of illegal moonshine stills in the area’s hollows and abandoned mineshafts. In honor of this history, the town of New Straitsville now hosts this annual event. According to the Explore Hocking Hills website, in addition to visiting the distillery, attendees of the the Moonshine Festival can attend a variety of events and enjoy moonshine-inspired food, desserts, and beverages. The festival also features carnival rides and games, and two parades concluding with the Grande Parade on Memorial Day. How will Hocking College use this space? Hocking College purchased this building in December 2017, with plans to use it for the Fermentation Science program beginning Fall 2018. 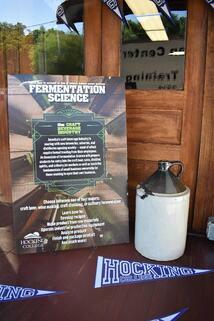 This program will include majors in micro-brewing, distilling, viticulture and microbiotic cooking. Students in the Fermentation Science program have the unique opportunity to learn in real-world training laboratories and will receive hands-on training as they immerse themselves in three different businesses owned and operated by the College; Rhapsody fine-dining restaurant, The Lodge Conference Center and the New Straitsville Distillery.